What Turkish steps and an Iranian wrestler can teach us about learning during and learning after. Its 00.15 on Monday morning and Turkish Airlines flight TK0898 from Istanbul Sabiha Gokcen International Airport has arrived on stand 20 minutes late in swirling snow at Tehran Imam Khomeini International Airport. To be fair the journey which started at London Gatwick at 11.55 on Sunday has been very good but with a busy day ahead, and a 60 minute drive to Hotel Niloo, the chances of being in bed much before 2am are receeding. Then events take a turn for the worse! 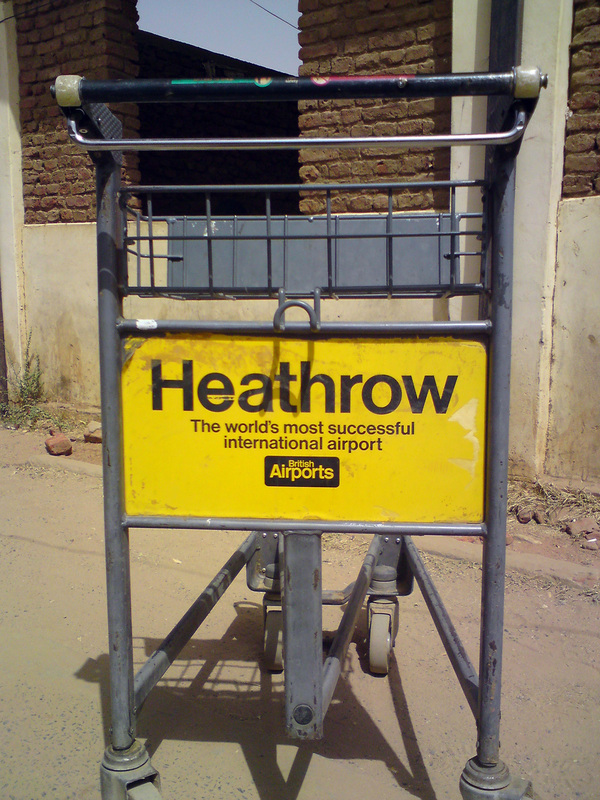 The steps to dissembark have a fault and it will be a further 20 minutes before an alternative is delivered to offload a plane load of very grumpy passengers many of whom are Europeans on the first visit to Iran. Fortunately I am at the front of the plane so able to converse with the Cabin Cheif. She is looking at the manual of useful information to give passengers during the flight and there is no entry to cover this situation. So she declines to make a comment while passengers fulminate. It could have all been so different! I am a great fan of checklists believing them to be knowledge enabled documents which should be, if they are regularly updated, the best practices of an organisation. And as I was to suggest during my client visit the best way to bring about a change in checklists often starts with an After Action Review (AAR) or a Learning Review. The AAR session would have surfaced all the issues about the lack of communication and (maybe) occasioned a change in operating procedures and their checklist – encouraging the cabin staff to keep people updated when things go wrong! 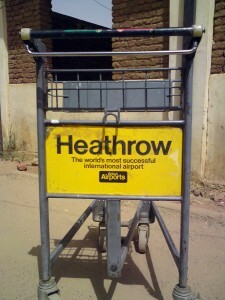 This is where the true value of tools such as AAR come in, they are precursors to a change in procedures or checklists. Many organisations’ Knowledge Management (KM) activity culmiates in the share and reuse step. I have come to realise while working alongside Ron Young and Knowledge Associates that the true value of KM comes from the step of Harvesting which involves turning what has been collected into learning’s and proposed process improvements which the process owner and subject matter experts review and accept or reject. 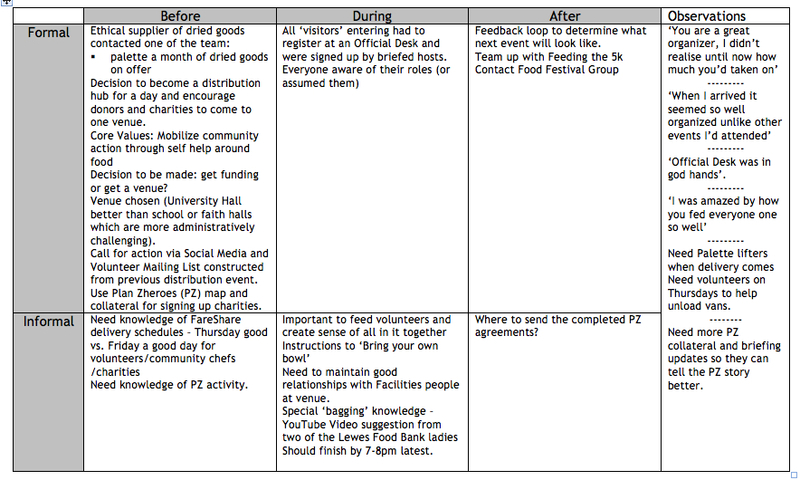 Checklists then get updated (or not) at that point and the organisation learns from doing! For the Harvesting step to work effectively though there has to be an environment that recognises and values the process of capturing and building on learning’s from such tools as AAR. Too often this process throws up dozens of action points few of which get actioned. If you can’t count the actions on the fingers of one hand its unlikely anything will happen as a result. So what will? 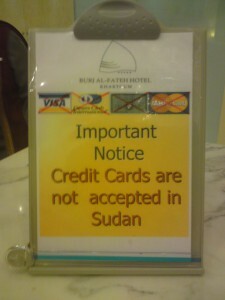 Perhaps this gives an insight. 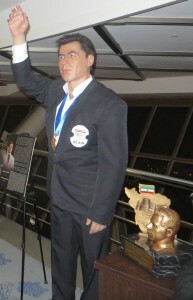 Gholamreza Takhti is one of the most, if not the most, loved sportsman in Iran. Here’s why: Takhti tended to act fairly when competing against rivals during his career, something which originated from traditional values of Zurkhaneh, a kind of heroic behaviour that epitomizes chivalrous qualities known as Javanmardi. For instance, once he had a match with Russian wrestler Alexander Medved who had an injured right knee. When Takhti found out that Medved was injured, he avoided touching the injured leg and tried to attack the other leg instead. He lost the match, but showed that he valued honorable behavior more than reaching victory. This act of chivalry and exceptional sportsmanship is seen as the desired way to behave and permeates a lot of business dealings. Effective Knowledge Management relies on effective Personal Knowledge Management. Appealing to the corporate good and the team ethic is not going to win supporters or make people feel individually empowered. Addressing the ‘What’s in it for me?’ question is vital: this is not purely about money but also recognition, self esteem and personal development. It’s one reason why many senior corporate positions are filled by academics and people value certification as a way of demonstrating knowledge and expertise. While we in the West think its quite natural to have an open and frank dialogue about what we could do better next time, its not always the case elsewhere. Our challenge is to find a way to surface learning’s and build them back into process while recognising its counter culture in a personal risk averse environment. A really timely thought piece ‘Becoming the law firm clients really want’ landed on my desk this week. By Peppermint Technology Research, it characterised the future of law firms as being ‘the death of difference’ noting that legal will become much like other sectors. This scenario has profound implications for lawyers, professional support lawyers and legal knowledge & information management (KIM) professionals. On December 9th Martin White and I will be hosting a breakfast breakout event at the RSA The future for Legal KIM: An Outside-In perspective. In it we will look at some of the issues facing KIM professionals. Martin and I have worked in many industries across many countries; we’ve seen and been involved in seismic shifts in the KIM roles in engineering, energy, the 3rd sector, publishing, software and finance. Our thinking in putting this event together was to share some of our experiences in a relaxed setting with like minded legal KM’ers. So over the past few weeks in the run up to the event we have been looking at the four big issues research had told us were near the top of the legal professions ‘must do’ list. 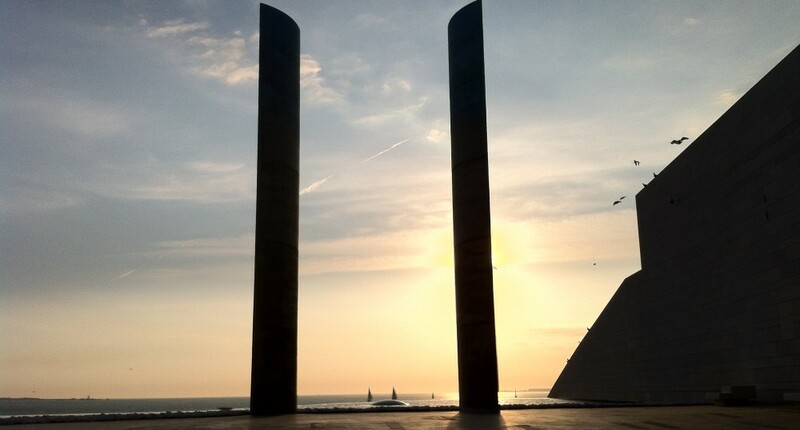 I began with Going but not forgotten: knowledge capture in a hurry, Martin then wrote The opportunities for digital workplace adoption by law firms and Certifying virtual teams – a key skill in digital workplace implementation. Today I am going to focus (from a KIM perspective) on the challenges of setting up a project management infrastructure that allows an organisation to learn from previous experiences and feed back learnings from the project back into the business. There are many project management disciplines being used in industry. The Stage-Gate new product development (NPD) methodology is one example in which the veracity of new products are assessed and resources allocated according to a set of criteria for each stage of the process. Knowledge capture is built into the process. What do we know about this subject and what has been done before? Who is an expert (internal and external) and can we get their input before starting the project? Who should we invite to the Kick Off meeting and how do we want to structure that? What structures are we going to use for management, monitoring and decision making? Who is going to be on the Project Steering Group and how do we manage those stakeholders and others? How often should they meet and in what format? How are we going to capture the outcomes of meetings, store the material we generate and make people aware of what’s happening? How do we collaborate across teams and boundaries to ensure the best possible decisions are made based on the best? Who do we go to for answers to tricky questions that arise and how do we do that? How often are we feeding learnings back into our project? Who is providing updates and in what format? Where are we storing progress reports? What format will the debrief take and who will be invited? When and where will you hold it? Who will be tasked to action the outcomes? 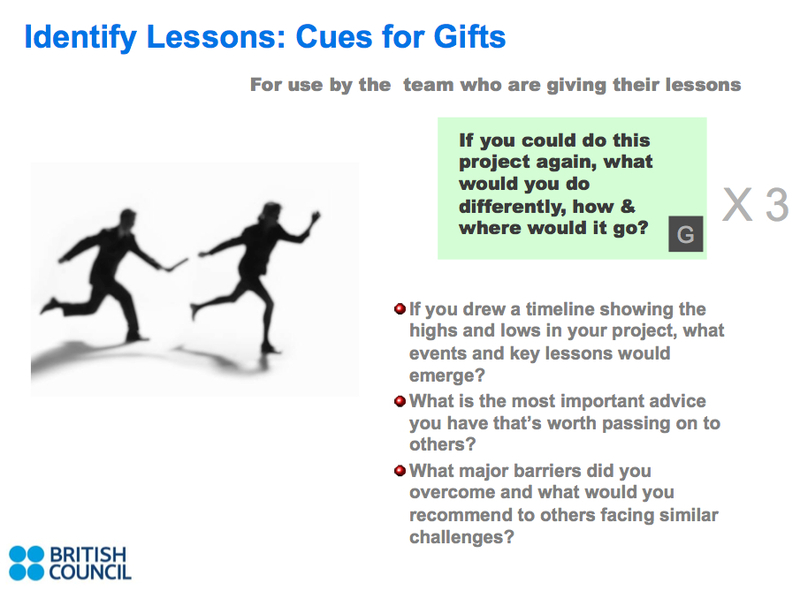 Alongside is an extract from the slides Victor and the British Council made available. It works, I’ve tried it! I have used in addition: After Action Reviews, Pause & Reflects, Retrospects to name but three. Earlier this year APQC published an interview with me in which I described the concept of DEBRIEF as a technique for capturing learnings at the end of various stages of projects. I will talk more about that on the 9th. It’s not too late to sign up here! Too often the KIM team are excluded from the project management processes in favour of an accredited (Prince 2 trained) Project Manager. In my view that’s a grave mistake, there are KM techniques for each step of the process and the good KIM’er will be well versed in facilitating such interventions. If you fail to learn from what you’ve done then you will not improve as a business and will be uncompetitive with those who do. David Gurteen rang me just before Christmas. 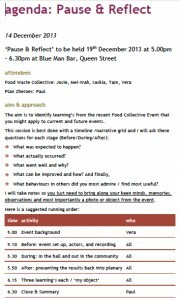 He’d read my recent blog post about the Pause & Reflect (P&R) debrief session I was running for the Brighton Food Waste Colllective and wanted to understand how it differed from an After Action Review (AAR). In a P&R debrief the team (with the help of the Facilitator) is attempting to go beyond the questions posed by an AAR: what was supposed to happen; what did actually happen; what went well; and what might we do differently next time? While these are valid areas of investigation they tend not to address the how or why an event succeeded or failed and overlook aspects of behaviour, space and culture. P&R sessions look at all of these through the use of timelines and objects by recreating what happened formally and informally, before the event, during the event and after the event. The technique I like to use is an A3 version of the Narrative Grid about which I’ve written before. By way of an example (and with the kind permission of Vera, Mei-Weh and Saskia) I’d like to draw on the recent P&R session in Brighton. * What was expected to happen? * What went well and why? * What behaviours in others did you most admire / find most useful? I will take notes so you just need to bring along your keen minds, memories, observations and most importantly a photo or object from the event. The session designed primarily as a capacity building/knowledge transfer session lasted but an hour. In that time a couple of key outcomes emerged and each of the team was able to highlight behaviours in others that made a real difference. It underpinned my belief that by being appreciative in the approach to debriefs and focusing on events a lot more emerges. when, where and how to use a Pause & Reflect? finally, don’t be too ambitious: 3 hours is the maximum I’ve found works and look at 1 event or decision not a whole project. 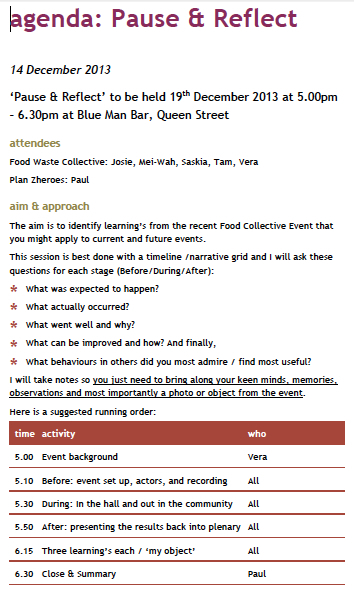 Tonight (Thursday) I will be in Brighton on behalf of Plan Zheroes running a Pause & Reflect session with the Food Waste Collective. We are going to be taking a look at the recent event they held at Brighton University and which I wrote about a few weeks back – when a good deed is lentil shaped: why a group of Brighton based women deserve our support. The agenda is time specific and requires the attendees to have thought in advance about an object or image that sums up the event for them. The other departure from the more traditional After Action Review process is that I try to get people to focus on the behaviours in others that really helped make the event work. 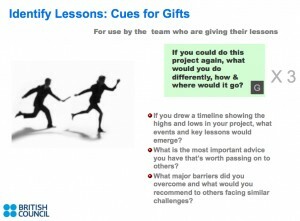 This appreciative inquiry technique is one I’ve found to be highly effective reflecting as it does on behaviours in a group environment. I’ve always been a great believer in the principle that less is more especially when looking back at an event or decision. And I tried to get everyone I’ve mentored or coached to focus on ‘the power of 3’. Most people can remember 3 things and act on them. Professor Victor Newman often tells a story about one of his early experiences going into an organisation and finding a lessons learned exercise came up with more than 200 ‘lessons’ which were noted down and taken away never to be acted upon. 3 ‘things’ is also a theme I apply in reverse brainstorming when getting people to consider how they can tackle ‘stuff’ that is broken. Tonight’s event is part of Plan Zheroes ongoing commitment to support volunteers outside of its core market. 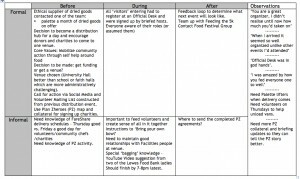 If we can equip others with basic skills and tools to improve the way they run events and interact with food donors and recipients fewer people will be facing food poverty and we will all be making better use of surplus food. I am looking forward to the session.